Update: Precious Chance Tetrick passed away on August 4, 2014. He touched more lives in his eleven years than most do in a lifetime. We have learned that nothing is routine. 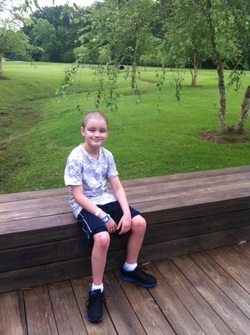 Prior to Chance's diagnosis of Acute Lymphoblastic Leukemia (ALL), our family was living a simple, routine life. In fact, the day Chance arrived for his appointment, it was nothing but routine. We started our day twenty minutes prior to the appointment. We expected to get the typical antibiotic prescription. But, I (Jenn) knew in my heart that we were going to get a cancer diagnosis. I did not, however, imagine that it would be of this magnitude. I was hoping that our pediatrician would tell me that Chance had a disease which resembled the symptoms of A.L.L.. The calmness of Dr. C. isn't unusual, but asking us to go to the main hospital for further testing was abnormal. He was honest and sincere. He didn't conceal the fact that he was testing Chance for cancer. Most physicians fail to properly address families during this transition. As we waited in the room for the test results, I watched Chance's behavior. He crawled upon the observation table and laid there complaining of coldness. He never jumped on that table, and he never begged to go to the doctor. God had prepared all of us for this news. He gave us all the direction we needed in order to be prepared. My tears were comforted by the softness of Chance's voice. He was assuring me that he would be okay. I am thankful for the calmness and gentleness of our physician. He started the wave of diagnosis acceptance in a nurturing tone. Because of his assurance, we were able to get passed the uncertainty or denial of the situation. We were ready to move forward. Moving forward hasn't been easy. We have faced many challenges. The medicine that is designed to cure Chance has often hindered his process. We have been ridden with secondary illnesses and admittance to the hospital. Likewise, we each have adjusted to the emotional changes in our family. We've been asked to be more patient and still. We've been asked to be understanding. Though, we lack the ability to really understand those finite questions as to why we are here in the first place. Day one was uncertain, but assured that we were in for a fight. On that day we entered into a prominent hospital (which shall remain nameless due to rules) in Memphis, we had a white blood cell count (WBC) of nearly one million, hemoglobin of 3.2, platelets of 7, and a fever of 105. Today, we have combated those numbers. Be with us today, as we enter into our second phase of treatment uncertain, but with the assurance that whatever the outcome is, there will be a safe landing for Chance.